Sometimes I wish I had Down Syndrome. I don’t say that lightly because I know folks with this diagnosis struggle with things just like anyone else. My oldest sister has Downs so for my entire life I’ve had a front row seat to her amazing attitude towards life. I hope you can give a handshake or a hug to someone with Down Syndrome while you’re out and about, as October is Down Syndrome Awareness Month. Ask them questions. Chat with them. Enjoy their perspective and learn what you can from it. I’ve learned a lot from my sister, starting way down in Key West, Florida. That’s where she was born. Then about 7 years later, that’s where I was born. Doesn’t sound like a big deal, right? Two siblings born in the same city? Well, it is a big deal because my dad was in the Coast Guard, so between my sister and I, we have 2 others siblings born in California and Virginia. The chances of she and I being born on the same little island was probably a million to one so that’s something we get to share that I am thankful for! In my childhood, here’s a little what I remember (and a shout out to my parents for this, as well): she was in public schools, she had jobs, played sports, and was involved at church. She loved being part of whatever was happening, whether it was managing the high school track team in Stafford, VA where she and our other sister attended, or working in the cafeteria at Westminster Christian School when my brother and I were in high school. Besides work stuff, though, she’s a great example of being a people person. I remember in college she had a “guy list.” Basically it was whoever was her favorite at the time. But being named Scott, Travis, or Troy helped a lot! Let me tell ya, though, guys were fighting to be #1! I think a few of the best ways to just make the list was simply to talk to her, give her a hug, and well, let’s be honest, you had to be cute. She’s a woman, after all! 😉 Mention anything good about the Gators though, and bam, you’re off the list! Providing water for the elite athlete’s at Masters Academy in Orlando, FL. All kidding aside, she’s always loved hugs. She’s so caring, so prayerful, very spirited and so genuine. Nowadays, she works a full-time job. She sings in the church choir. And just the other day she was the honorary water girl at my nephew’s middle school football game. She loves sports, that’s for sure. She’s also so good in front of a crowd, something I admire about her. She will get on a stage to play piano, sing, whatever and yes, she gets nervous about it sometimes, just like I would, but then she goes on stage and slays it! She knows how to love well, often, and consistently; asking about your day, adding you to her prayer list, and hugging you whether you need it or not. She also loves animals, especially every pet that’s ever been in our family including my dogs, Piper and Asia. When I was in middle school our family had a ferret and I kid you not, that thing was evil. Nipper got her name because she gashed our ankles with her devil teeth. She was a wild ferret who wouldn’t be tamed. We couldn’t hold her without being bitten or clawed. Tough times! But they weren’t tough times for my sister. She could pick Nipper up, snuggle her, hold her, pet her and Nipper was as calm as a morning sunrise. It was sweet and slightly frustrating. But it’s because my sister, at her very core, is sweet and caring. We were in line to get lunch when this guy who was slightly intoxicated cut to the front of the line. Players in this story are: Suit Guy (not sure why he was wearing a suit but OK), Kid (about 15 yrs old or so), Gator Belly (the drunk guy, who was wearing a Florida Gators shirt), and me. My sister Shannon was safely off to the side under a decent shelter. Order after order had the staff in the trailer/kitchen backed up so it was more tense that it needed to be. Of course, getting rained on didn’t help either. Suit Guy was the first to confront Gator Belly. He was quite articulate in his stance against this guy cutting, and I was in full support. But Gator Belly wouldn’t back down and leave. He just stood there like he was making some sort of civil rights statement. But he was white, he was wrong, and he was rather annoying. Suit Guy said his piece and all remained quiet on the western front. As Kid and I moved up to order, Gator Belly again tried to jump in front of us. The kitchen staff handled it poorly. They should’ve made the guy leave with threats of calling authorities but they just smiled and tried to wish it all away. Gator Belly wasn’t leaving. They say to pick your battles, and I guess this is one Gator Belly chose in the moment. Well, guess what? So did I. Picking up where Suit Guy left off, I confronted the line-breaker by telling him he needed to leave. I kept thinking of all the folks in line behind me who’ve been waiting for half an hour, and the Kid who was sort of shuffled off to the side, perhaps not even getting a chance to get his order in. My anger rose. I wasn’t going to let this guy win. Not today. Words were exchanged and all I can specifically remember is saying, “You have an ugly shirt and an ugly attitude!” Nice one. I’m not proud. I wish I’d thought of something more clever but the truth is he did have an ugly shirt (remember, it was a Florida Gator shirt), and his attitude was poor. Then at one point I put a hand on his shoulder and told him he’s not going to order before us. That’s when he bowed up and said something to the affect of “Touch me one more time!” I didn’t touch him one more time. I won’t even get into the fact that while this was happening, the guy behind me ordered his food and left. That was a cold thing to do, sir. But the story ends better than it started. My sister got her chicken sandwich and so did the young Kid. Plus, I managed to get my cheeseburger without a side order of a black eye. And if you can believe it, there’s more to tell from our first NASCAR race ever! Check out part 6! Tim Tebow is not someone I should like. Before he was the poster-boy for media scrutiny, before he donned a Denver Broncos jersey as their quarterback, before he and his mom appeared in a Super Bowl commercial, he was a Florida Gator. 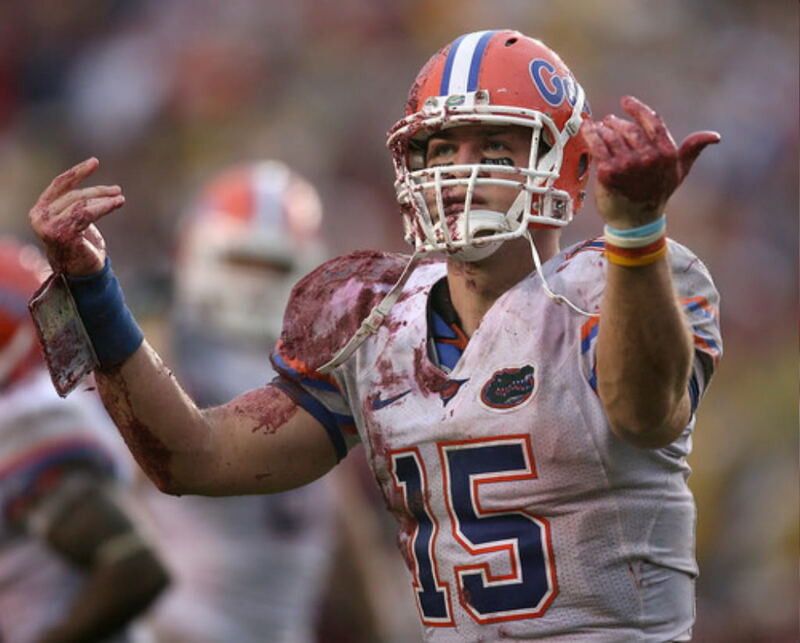 And where I come from, it’s great to be a Gator hater. I’ll even avoid picking up NFL players who went to Florida (or University of Miami for that matter) on my fantasy football team. Just like country singer Blake Shelton, I listen to Christmas music year-round so a few days ago “Little Drummer Boy” queued up in my iTunes. The song lyrics are about a young boy approaching the baby Jesus. He doesn’t have any gifts to bring him, the newborn King. So what he gives is the only thing he has: the ability to play drums. The story goes on with Mary approving his request so the drummer boy played his best for Jesus. At the end of the day, isn’t that all Tim Tebow is doing? He puts on his pads. He laces up his shoes. Then he goes out and plays his best for Jesus. I can support a guy like that, Gator or not. I wanted to date and learn the hard way, and sadly, in some cases I did. However, with the experiences and failed attempts at long relationships, I learned what I liked. I also learned what I didn’t like, which would later become my deal-breakers. Early on in college I created of list of things I wanted (deal-makers, perhaps?) in an ideal mate. Things like a goofy sense of humor, enjoying but not understanding sports,a dog lover, a healthy disregard for cats and the Florida Gators, on and on the list went. I was very specific in what I was looking for and what I knew I wanted. Probably too specific because now, as a thirty-one year old adult male, my list has shrunk to a few general yet more absolute characteristics. It’s also easier now to narrow down the potential field using the list of deal-breakers rather than the deal-makers. What I mean is this: instead of finding what I want to live with, it’s easier to eliminate the ones who have what I cannot live with.